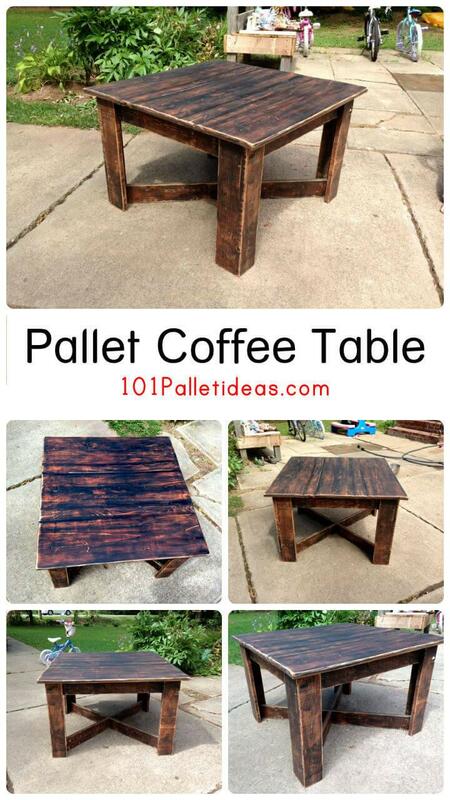 We are going to show you here that how you can recover beautiful tables from pallets! 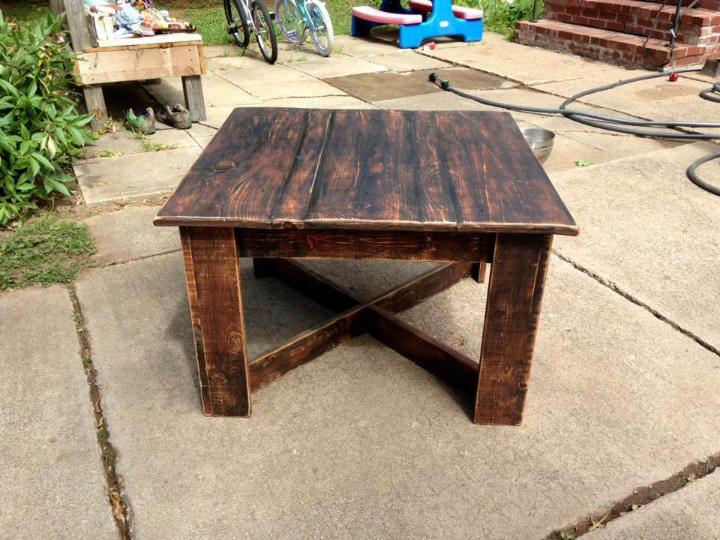 To make you inspired more we have picked a practical and handcrafted coffee table sample here, take a look at the style and dimensions of this DIY square pallet coffee table having a 32 X 32 top and comes with a criss cross base that is always more supporting and stable! This robust table with custom dimensions has precisely been composed of individual pallet slats that have been reconditioned first through some primary wood operations like gritting, hand-rubbing and varnishing etc. Then the reconditioned planks have been resized according to dimension-plan of the table and have been integrated for the final stunning pallet coffee table output! 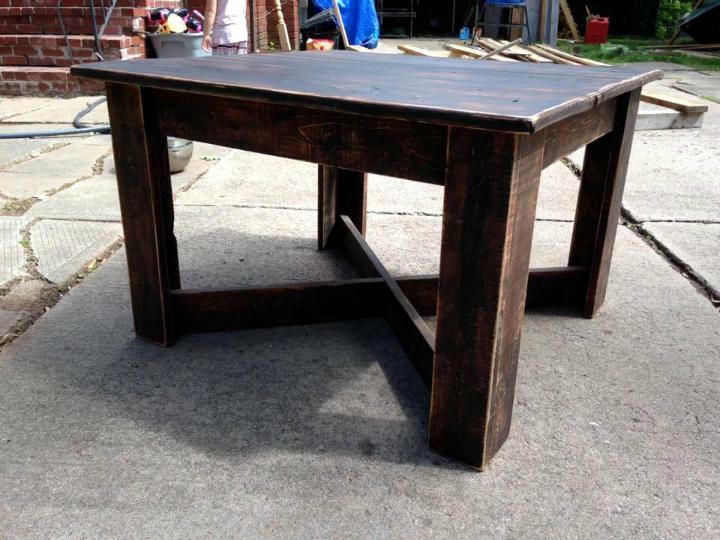 Legs of the table are also made of custom-cut pallet slats and have been held in place strongly through the cross beam supports! Final precious choco look has been gained by applying few coats of stain selected in respective shade! 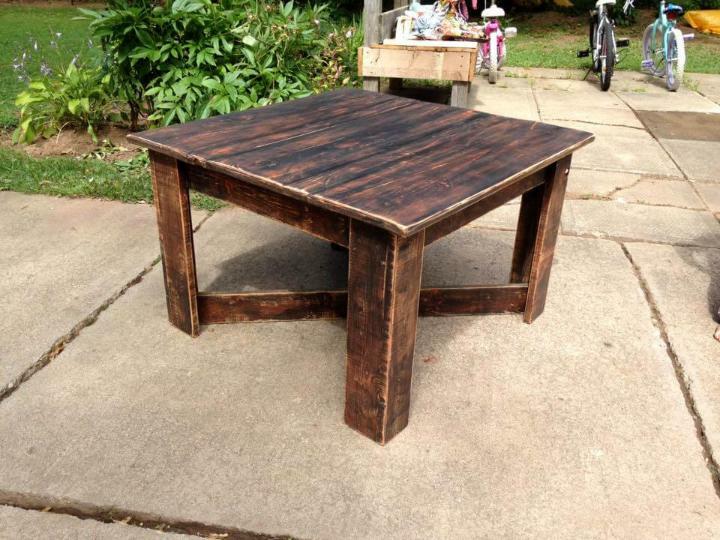 So you can get creative with pallets every time you need the flawless wooden tables for free, can be built in any style you want or having in imaginations! 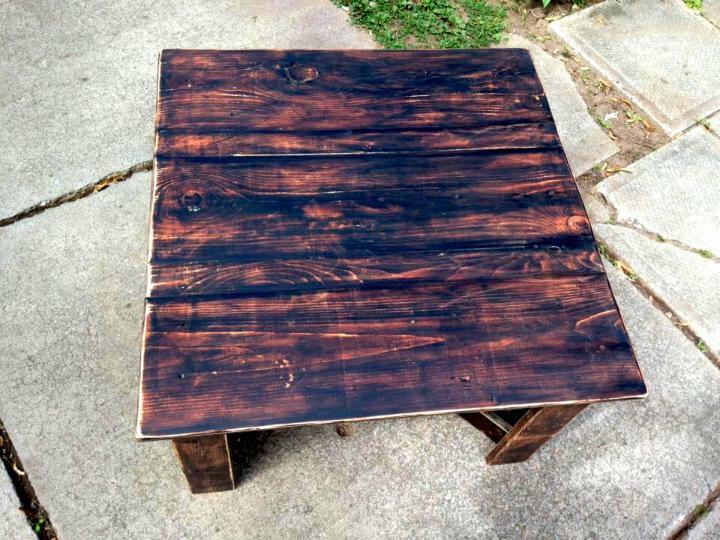 This exclusive mini one can also be decided as a side or end table for your bigger outdoor sitting plans, the final stain coats will keep it look young longer! The bottom criss cross supports bring a unique style to entire table along with lot of stability too, you can also vary it in any way you like! Just like this mini one, you can also integrate the separated pallet slats to install bigger tables always need in your home like the accent console and dining tables! 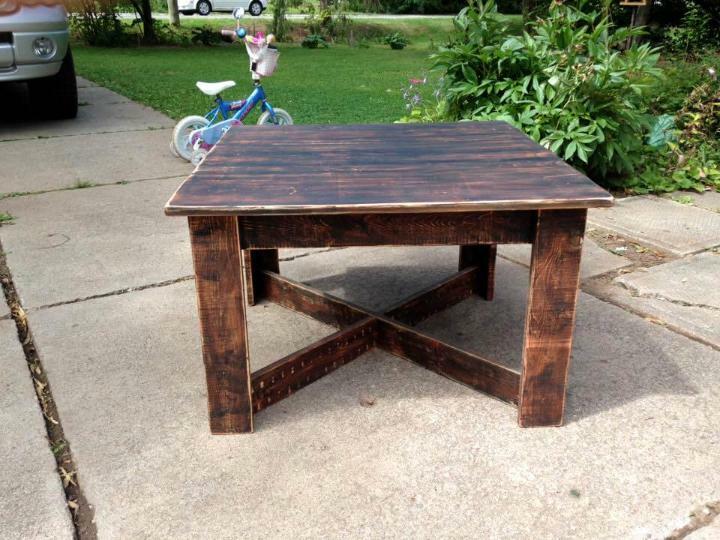 Paint may also be rocking choice if you are willing to get your finally finished wooden table colorful, it may be a demand of the space where it has to be used! 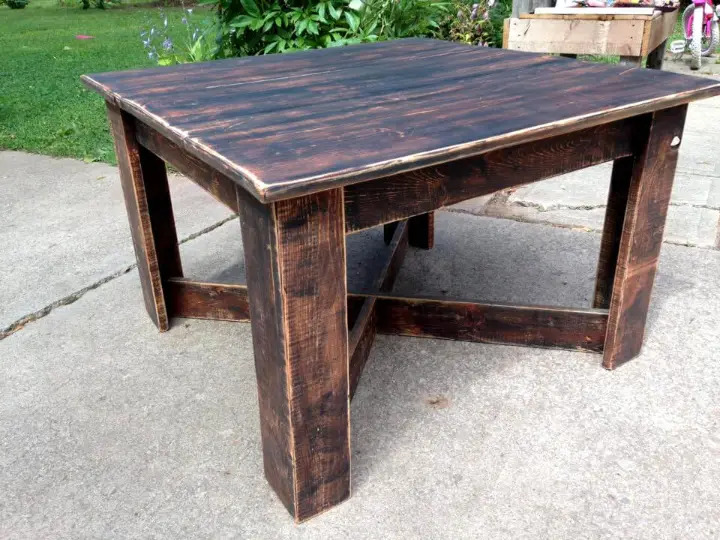 Wooden handmade table with final antique dark brown appeal, is ready to be in front of any sitting chair, bench or pallet sofa just for a sophisticated sitting plan there!